It’s best to book lessons in advance, particularly at busy times, and we are happy to advise and help you organise this. ESF, the French ski school, (www.esf-peiseyvallandry.com) offer group lessons for adults and children throughout the season. You can also book private lessons and if there are 2, 4 or 6 of you at the same level this can be a viable option. There is an English ski school (www.skinewgen.com) in the resort and many independent French and English instructors who both offer group, private lessons and clinics. Children’s group lessons are only available through New generation during school holiday periods. There are a number of hire shops in the resort all giving an excellent service. Our clients are offered a 15% discount at Paradisport, which is conveniently placed at the bottom of the 74 lift in Vallandry. If you want to change your skis or boots during the week they are very accommodating and are happy to swop skis for snowboards or off piste skis for a days trial. Intermediate skis poles and boots for adults will cost in the region of £85 for 6 days, £40 for children. Maybe you don't want to ski or snowboard every day or there is someone in your party who doesn't 'do' either. There are plenty of alternatives to downhill skiing or snowboarding, and because our unspoilt village of Nancroix stands at the gateway to the stunning Vanoise National Park, many of them are only a couple of minutes away. Cross country ski or walk in the National Park on groomed trails or take a guided snowshoe trek looking out for chamois, ibex and the majestic lammergeyer. 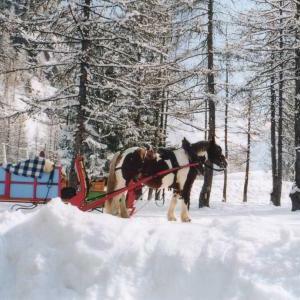 Ride on a horse drawn sleigh or husky sledge to the end of the Ponturin valley between the Bellecote and Mont Pourri glaciers while your driver points out local wildlife and tells you a bit about the area. For the more adventurous we can put you in contact with local companies who organise ice climbing on frozen waterfalls, heliskiing, or can take you for different view of the resort on a tandem paraglide flight. The Olympic bobsleigh run is just across the valley in La Plagne where you can experience the thrill of hurtling down the ice at nearly 120km an hour, or you could spend a morning snowmobiling or ski jöring.